Custom Power Supplies designed and built specifically for the circuit boards used in the SMS access control system (aka "Geoffrey System") by Vanderbilt Industries in the USA. 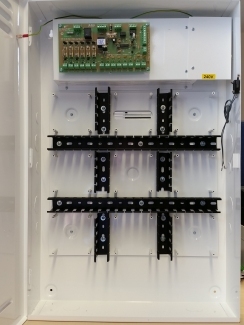 Designed specifically for the Vanderbilt Industries SMS Access Control System (formerly known as "The Geoffrey System") the VA627 provides both 12VDC and 24VDC outputs and can accomodate up to 9 Vanderbilt Industries VRINX, VSRC and VIONX-8 Circuit Boards. Housed in a white painted wall-mount enclosures, the VA627 houses a number of useful features for system builders who wish to have control over their power supply. 6 dedicated lock outputs provide 12VDC at 1A for each lock circuit. Each one can be selected via jumper-link for control via a global lock-disable input if required (see description below). 6 dedicated PCB outputs provide 12VDC at 0.5A for each door control PCB or I/O PCB. 2 dedicated 24VDC outputs provide 0.5A each for an SMS VSRC controller PCB. The monitoring outputs are intended for connection to system inputs. The Mains Failure output indicates when the AC mains input has failed (the PSU can still function if back-up batteries are installed). The Battery Low Voltage output indicates when the battery voltage falls below approximately 10.7 VDC. These inputs are intended for interfacing with other systems. The Lock disable input is primarily intended for receiving a voltage from a fire alarm panel to disable the lock outputs thus allowing the locks to unlock aiding personnel evacuation. The Output Shutdown input is intended for remote shutdown of the power supply to effect a system hardware reset if needed. Mechanical single-pole tamper switch for direct connection to PCB input. Space is provided for 2 x 7Ah Sealed Lead-Acid (SLA) batteries independently wired. The VA627 uses a 35W DC/DC converter to maintain the 24VDC output whilst running on the batteries. When battery voltage has dropped to approximately 9.8 VDC the VA627 will shut down to prevent battery damage caused by deep discharge.